Is it Possible to Trick a Drug-Sniffing Dog? The post Is it Possible to Trick a Drug-Sniffing Dog? appeared first on High Times. Is it possible to trick a drug-sniffing dog? Enthusiastic members of high society have, for decades, told toker tales about how they avoided getting narced out by a K-9 unit during a roadside shakedown. Some have argued that these stories are only urban legends, while others swear that they know a guy who has a cousin whose best friend once smoked weed with an old man that actually did trick the high-powered sniffer of a canine cop. The stories circulating the scene often suggest the scent of marijuana was masked with a more pungent substance. Other accounts imply that the secret to fooling law enforcement hounds is all in the packaging. But there is too much at stake to leave pot smuggling to chance. Although marijuana is now legal in over half the nation, there are still plenty of cowboy cops out there ready to nail your balls to the wall for even thinking about transporting weed into their God-fearing community. Therefore, it is crucial that we get to the bottom of the science behind drug-sniffing dogs once and for all. There is a reason that law enforcement agencies all over the world use dogs to bust people for drugs. These animals are equipped with olfactory nerves vastly superior to humans. But these beats do have some limitations. Dogs cannot smell through material. The problem is that most material has microscopic pores, which allows odors to permeate. So, if marijuana is stashed inside plastic or even glass, the aroma will eventually make its way to the outside of the container. This is called an “odor cone.” The longer marijuana is kept there, the more likely it is that a drug-sniffing dog is going to pick up on the scent. But dogs have a unique talent in the way they smell. Man’s best friend uses its nose much differently than humans—picking up on individual odors rather than just one. For example, if there is a pot of chili on the stove, humans smell chili. But a dog can identify beans, meat, tomato sauce, peppers, and various seasonings. That’s right—dogs smell every ingredient separately. Let’s say marijuana is wrapped in plastic, stuffed in a glass container, spayed with a strong perfume and then stashed inside a gas tank. The odor of the weed will make its way out. And if that happens before a police officer decides to sic a K-9 on your vehicle, you’re royally screwed. It is impossible to mask the scent of marijuana from a drug-sniffing dog. This is what gets a lot of inexperienced drug smugglers pinched early in the game. Forget about it. You cannot fool a dog’s super sensitive sniffer. Don’t even try. While the chances of tricking a drug-sniffing dog are slim, there is some science that might help reduce the risk of detection. Odors permeate through the tiny pores that exist in most materials. But some materials are more non-porous than others. If a smuggler can get his or her hands on a lead box that seals tightly, allowing no odors to escape, this might be the best chance at fooling a drug dog. But the problem with using a lead container, aside from the obvious weight issue, is the police officer guiding the K-9 around the vehicle might get suspicious. Because why would anyone ride around with a lead box in tow if they didn’t have something to hide? It wouldn’t take long for the cop to get a search warrant and discover your X-ray vision proof pot stash soon after. This is not the way to go. Colder temperatures slow down the permeation rate. Therefore, freezing a weed shipment in ice before transporting it might be a solid method for tricking a drug dog. But depending on the size of the shipment, this, too, may arouse suspicion in an officer. It is important to understand that ice will only slow down the permeation process. It will not stop it. Cold weed will only buy the smuggler time over short distances. How marijuana is handled prior to packaging is also a crucial element that cannot be ignored. Weed contains microscopic dust particles that have a way of lingering on a person’s hands. This pot dust can be transferred to whatever is touched following packaging. Cars doors, steering wheels and personal clothing can all be tainted by weed particles. So regardless of how odor proof the marijuana shipment might be, a K-9 could still alert. Many smugglers use Latex or Nitrile gloves when handling marijuana in areas of prohibition. They also may send someone out to have the car cleaned, inside and out. How Have People Tried To Trick Drug-Sniffing Dogs? We have established that it is impossible to trick a drug-sniffing dog, but that doesn’t mean one can’t confuse it and his handler. There are a number of measures that smugglers have taken to decrease the chances of getting popped by a pesky narco-mutt. Drug dogs may have con-proof sniffers, but they are also predatorial creatures. This means any sign of another animal in the immediate vicinity is going to drive the pooch wild. Some people traveling with weed have sprayed the vehicle’s tires with synthetic deer scent (urine) or have traveled with a pet to create this confusion. These methods could deter a K-9 from his mission to find weed. Even if the officer removes the “family pet” from the vehicle, the dog may still be too wound up about protecting its territory to focus on his job—putting you in jail. Final Hit: Is it Possible to Trick a Drug-Sniffing Dog? 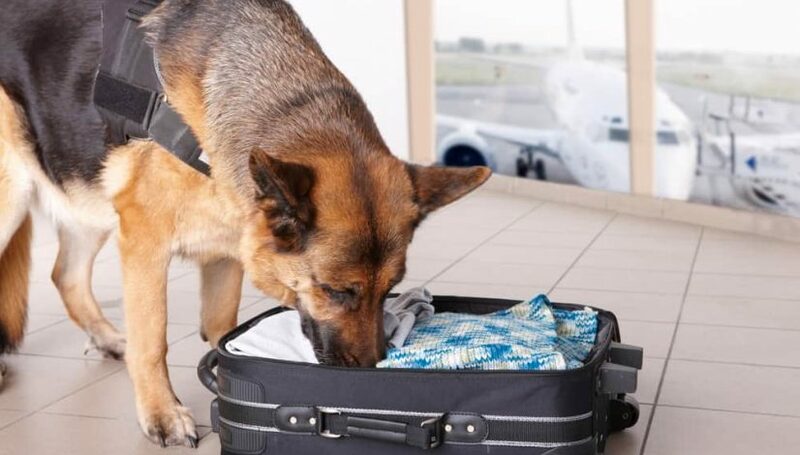 It is possible to trick a drug-sniffing dog, but it is not likely. Most smugglers simply take precautions to ensure that they never get pulled over in the first place. They avoid using a vehicle branded with Grateful Dead and Pink Floyd stickers. Some reports have even suggested that Fraternal Order of Police or DARE window decals are enough to get cops sniffing around for weed. People traveling with marijuana just try not to stand out, obey traffic laws and make sure their driver’s license and plates have not expired. They are conscientious about making sure all exterior lights and turn signals are working properly. They obviously don’t smoke marijuana during the transport. After all, the K-9 unit is only going to get called out if the officer has reason to suspect that drugs are in the vehicle. Emmy Winner Lena Waithe Chats With Snoop Dogg On GGN	My Rental Car Smells Like Weed… Now What?